Keyword density in terms of search engine optimization is actually the percentage of words on a web page that is based in the keyword phrase being targeted by the author. In another definition based on the specific context of SEO or search engine optimization, keyword density can be used as a factor in determining whether a web page is relevant to a specified keyword or keyword phrase. Due to the ease of managing keyword density, search engines usually implement other measures based plainly in relevancy to prevent webmasters from intentionally creating search spam through practices such as keyword stuffing. In a webmaster’s point of view, keyword density refers to the ratio (percentage) of keywords contained within the total number of indexable words within a web page. Keyword density is a very sensitive part in Search Engine Optimization. In fact, this is probably the most important part of SEO in terms of content management and relevance. Since most would consider that “content is actually king”, then this fact makes keyword density as an integral part of SEO and therefore should be made as the main point of concentration in every content making of any web page. Also, there are actually lots of tools that any webmaster can use for determining the keyword density of a web page there are free and premium, paid keyword tools that you can use for all your keyword density determination needs. The preferred keyword density ratio varies from search engine to search engine. Generally speaking, I would like to recommend using a keyword density ratio (standard) in the range of 2-8%. Another thing to consider in determining the actual keyword density that you would like your web page to fall in is to know whether what number of target keywords you have in your content in terms of the overall words contained that are indexable by the search engines. There is an ongoing theoretical explanation by webmasters today that the more times a keyword or keyword phrase appears within a web page, the more relevance a search engine is likely to give the page for a search with those keywords. But this seem to be not true at all in terms of search engine rules. Google seem to like a little bit higher in terms of keyword frequency or the number of times that a certain target keyword appears in a web page. In general, I recommend that you ensure that the most important keyword or keyword phrase is the most frequently use keywords in a web page. Although you must remember to be careful overdoing it and not to abuse the system by repeating the same keyword or keyword phrases over and over again. This is called spammy content and would possibly cause you to loose instead of gaining rankings in the major search engines for your target keyword or keywords. Keyword prominence is generally about knowing how prominent keywords are within a web page. The general recommendation is to place important keywords at, or near, the start of a web page, sentence, TITLE or META tag. This would help you get higher rankings in terms of optimizing your content for the bots and spiders of the major search engines. Hierarchy of key phrases are also part of the game as most webmasters today would actually make use of H-TAGS in posts and html to make the target keywords as prominent as possible than the other keywords present in your content. This is done by giving an H1 tag for the target keyword you most would prefer the search engines to see as more of importance or prominent than the other target keywords. H2, H3, H4….. and so on will be the following tags for other keywords that you would like to give less importance to. 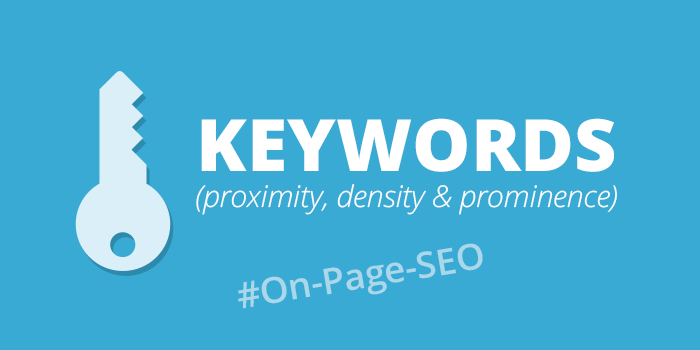 Keyword proximity refers to the closeness between two or more keywords. In general, the closer the keywords are, the better. This is to be considered of key importance because if you overdo this one, you might get tagged also as a spammer and chances are that your web page will look odd due to improper keyword proximity. In view of the example above, if by chance that a web surfer searched for “search engine rankings,” the first example that used the keyword in the sentence has greater or a much higher chances to rank higher than the second example i gave above. The reason for this is because the keywords are placed closer together and in proper order than the other. This is assuming that everything else aside from the keyword proximity is equal in all aspects and angles possible for considerations.